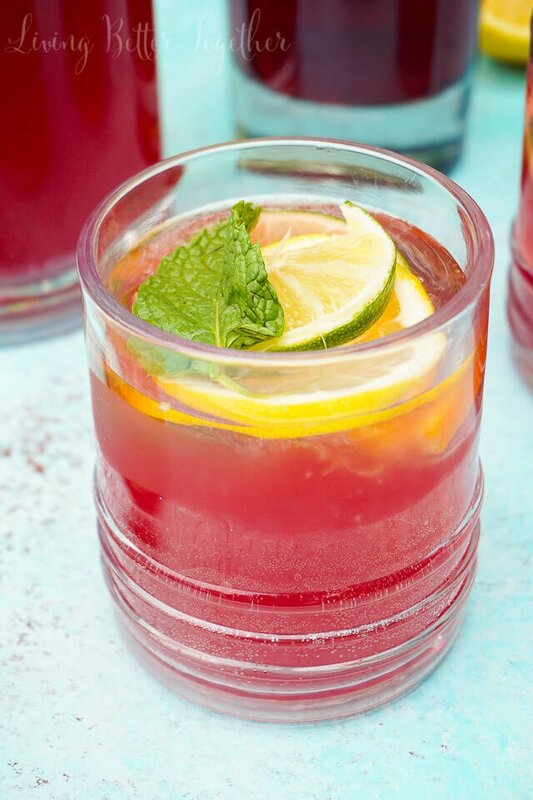 Celebrate summer with this Pomegranate Citrus Punch! 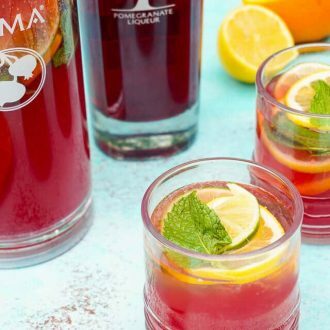 Sweet PAMA Pomegranate Liqueur paired with lemonade, lemon-lime soda, and rum for a splash of summer fun. GUYS! Today is a very BIG day! You wanna know why? Whelp, I’ve made the plunge into video! Yup, that’s right, if you scroll down a little ways you’re going to get a 3-minute recipe video with yours truly! The recipe I’m sharing is for this simple Pomegranate Citrus Rum Punch and you’re going to love it. Please excuse the fact that I definitely say “ices” instead of “ice” and I say “um” a lot! Other than that, I had a lot of fun and I can’t wait to bring you more great videos this summer! But for now, onto the recipe! 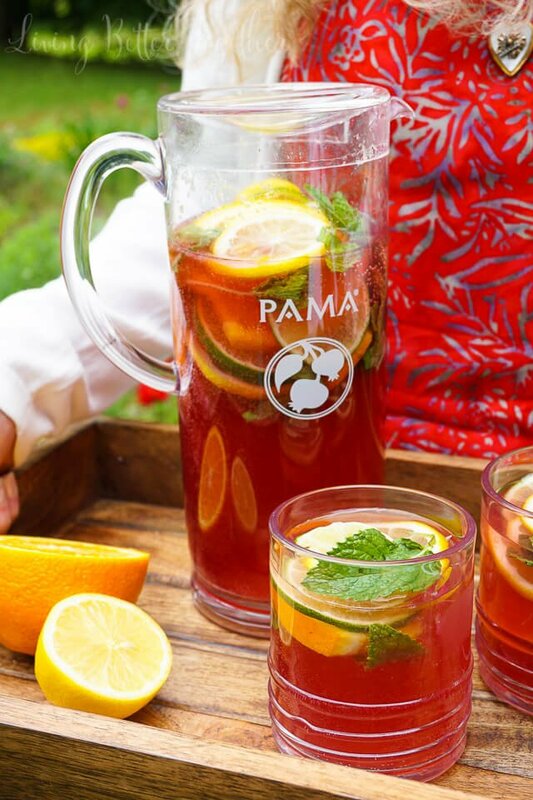 This punch combines PAMA Pomegranate Liqueur, rum, lemonade, and lemon lime soda with fresh mint and slices of citrus. The PAMA makes It colorful and sweet and just a tad tart! The punch itself is fresh, fun and perfect for at any summer celebration. Speaking of summer celebrations, it seems like they’re finally in full swing! With the 4th of July behind us, we’ve got about two months to soak up the sun and make some beautiful memories. My favorite way to enjoy the summer months is on the back deck with friends and family. Start the day while the sun is high with a BBQ, a game of Koob, and a dip in the pool. Wind down the evening with a bonfire and some s’mores and maybe even a backyard movie. For those who want to stick around later, head inside for some cocktails and a round of Cards Against Humanity! That my friends, is the ideal summer day! Check out my Celebrate Summer Pinterest board below for more great summer entertaining ideas! What’s your ideal way to celebrate summer? Is it a day at the beach? Maybe it’s family and lawn games? Or maybe it’s laying out on the lawn with a drink and a summer read. No matter how you like to enjoy those summer days, I’m sure you’d all like to win some spending cash to make them even more amazing! PAMA is currently running a summer contest, and if you win, PAMA will help you bring your summer celebrations to life. There will be a grand prize winner and four runners up! For details on how to enter and make all your summer dreams come true, visit PAMA Liqueur. 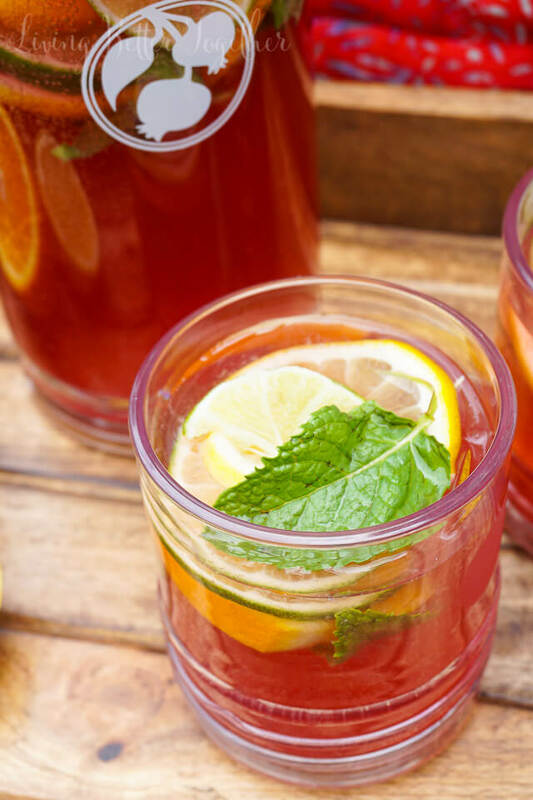 Celebrate summer with this Pomegranate Citrus Rum Punch! 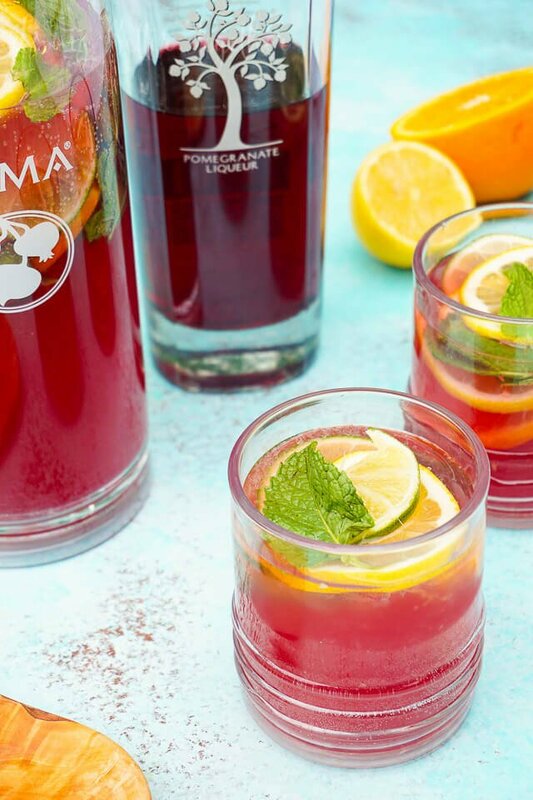 Sweet PAMA Pomegranate Liqueur paired with lemonade, lemon lime soda, and rum for a splash of summer fun! Additional mint and citrus slices. Slap mint between hands and add to a large pitcher with citrus slices. Pour in lemonade and use a wooden spoon to muddle a bit. Add rum and PAMA and stir. Serve over ice and additional mint and citrus slices. This sounds so delish. I am boiling in sweltering heat without AC right now and could definitely use one of these cold ones! Your video is great- especially love the cooing dove in the background! This looks so good! 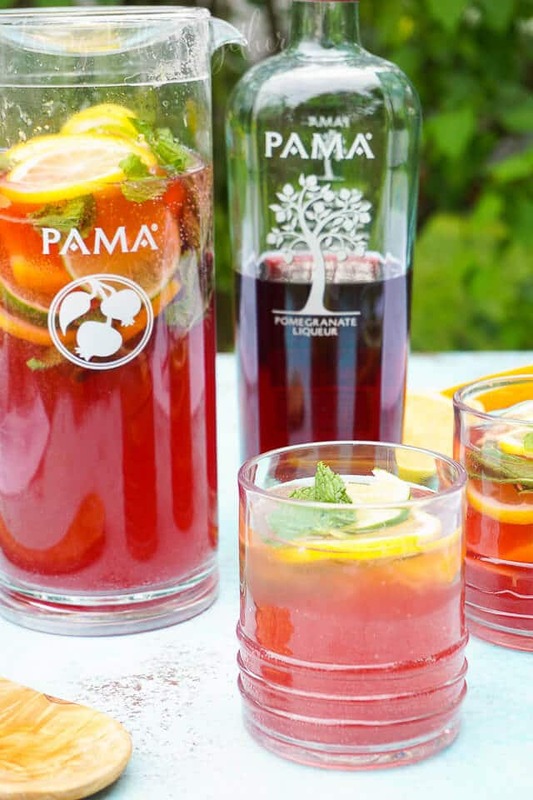 Might have to try it for our party this weekend…I have some PAMA in the pantry!